5 hours before you want to eat – combine tomato paste with 3 cups of water; set aside until ready to use. In a large dutch oven set over medium heat, combine onions, pancetta, and 3 Tb olive oil. Cook, stirring occasionally, for about 10 minutes. Add carrots, celery, and garlic and cook another 3 – 5 minutes. 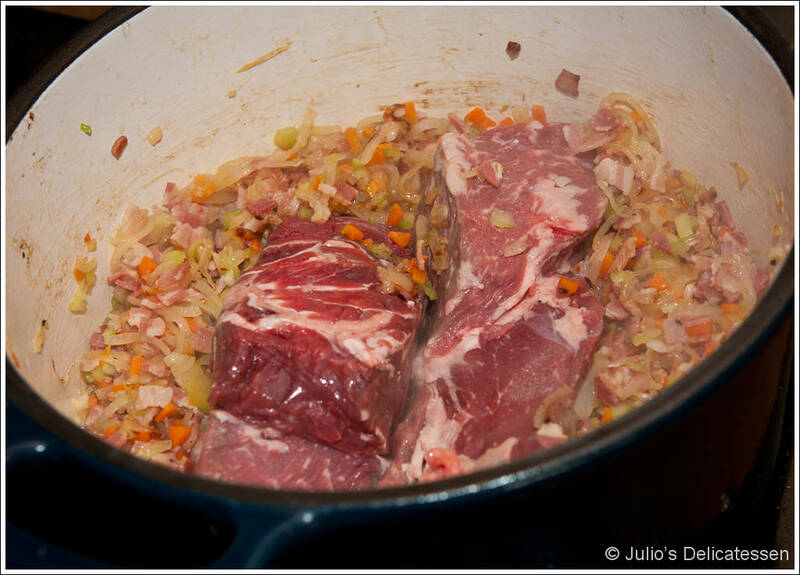 Scrape vegetables to the sides of the pot and add the meat to the middle. Cook for 5 minutes, then flip and cook the other side for 5 minutes. (You may also want to stir the vegetables to keep those on the bottom from burning.) Add wine, stir, increase heat to medium-high, and cook until wine has mostly evaporated – about 7 minutes. 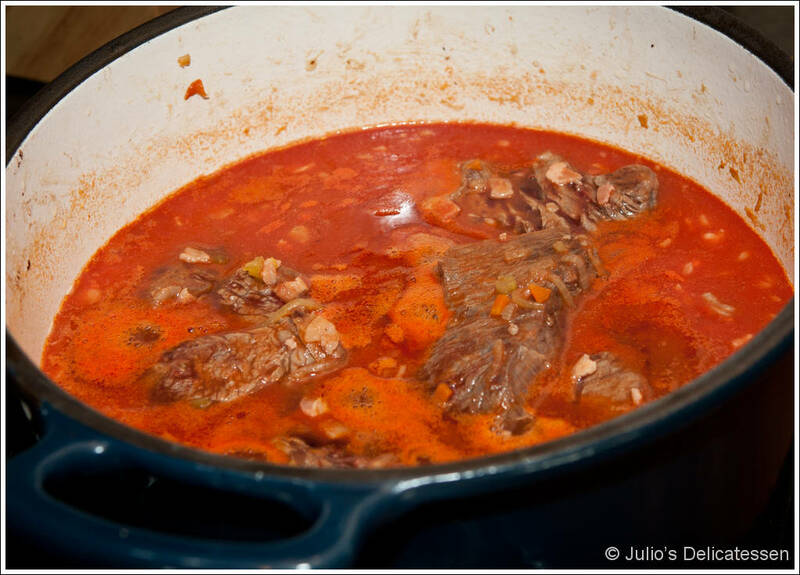 4 hours, 20 minutes before you want to eat – add tomato paste mixture to the pot. Stir to combine everything, bring to a simmer, and reduce heat to low. Cover the pot. Gently simmer, stirring the sauce and turning the meat occasionally, for about 2 hours. 2 hours, 10 minutes before you want to eat – Add the remaining 3 Tb olive oil, some salt, and more water if sauce is becoming too dry. Continue to gently simmer, covered, stirring the sauce and turning the meat occasionally, for another 2 hours or so. 25 minutes before you want to eat – bring a large pot of salted water to boil. Add pasta and cook to al dente. Drain. 5 minutes before you want to eat – Transfer meat to a serving platter. 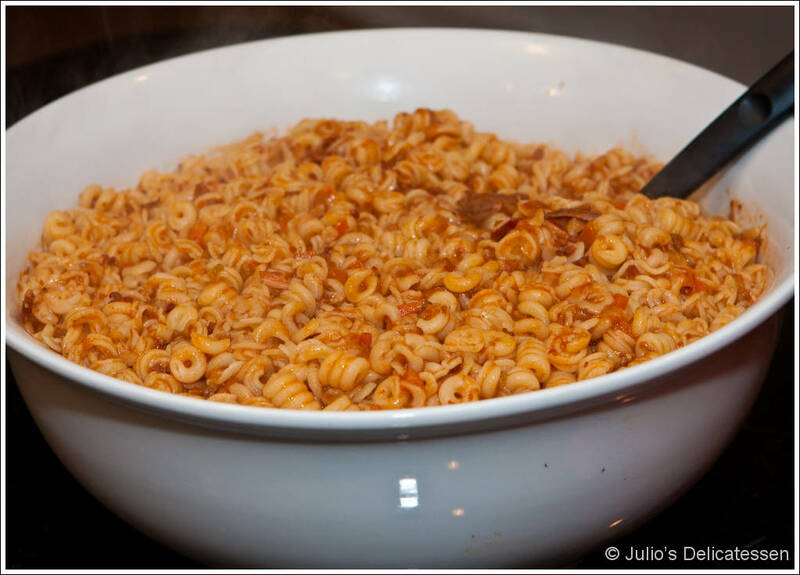 Add the pasta to the pot with the sauce. Stir or toss to combine. Serve immediately.